Bminer is a highly optimized cryptocurrency miner that runs on modern NVIDIA GPUs (Maxwell and Pascal, i.e. GPUs that have compute capability 5.0 or above). Bminer is one of the fastest publicly available miners today – we use various techniques including tiling and pipelining to realize the full potentials of the hardware. Improve the performance for Cuckatoo31. Reduce the CPU usages for Grin / Aeternity by default. Reduce the likelihood of rejected shares for Cuckatoo31. Experimental support for Cuckatoo31 on 1080Ti. Fix the regression where ETH dual mine fails to start on Windows. Improve performance on mining Aeternity. Support tweaking the CPU usage for mining AE / Grin with the -intensity flag. Improve performance of AE / Grin on Turing cards. Improve performance of AE / Grin on lower-end CPUs and Windows platforms. Support mining beam on leafpool and nicehash. Fix the regression where /api/v1/devices is occasionally unresponsive. Improved multi-card performance on Windows. 30% performance improvement on Grin and AE. Reduce the likelihood of rejected shares. Fix compatibility issues with grin-pool.org and grinmint.com. Experimental support for Turing GPUs. Allow bminer to run with older NVIDIA drivers. 50% performance improvement on Aeternity. 10% performance improvement on Grin. Support 8GB cards on Windows 10. Support SSL connections for Grin. Please see https://www.bminer.me/performances/ for more performance information. Substitute ak_27we6r5KVGpErVGedqFByq2GAEYrUP39G51jnadMRrDux1YDay with your own AE address. How to tweaking the CPU usage for mining AE / Grin with the -intensity flag? can i mine on other pool ? Thank you for the English version! May I ask what pool you want to use? You can use f2pool at this moment, we will support more pools in the future. Ok so to use your miner we need to mine on f2pool… One pool one miner… It’s kind of sad. I know it’s not your fault. We will support more pools in the future. Significantly better on one GPU (1070) with 398.11 driver (Win7) - 2.98 H/s. 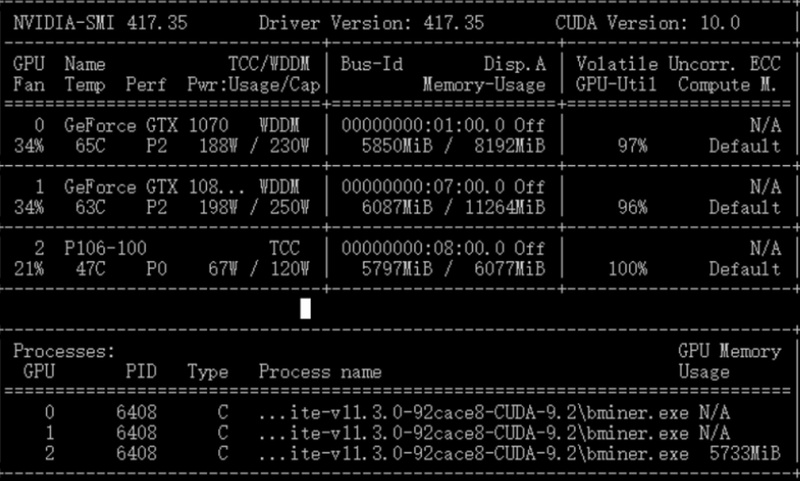 Significantly worse on 6x1070 rig with 416.94 driver (Win7) - about 1.4 H/s per each GPU. Can it run as high as 6*2.98 H/s on 6xGPU rig? Significantly better on one GPU (1070) with 398.11 driver (Win7) - 2.98 H/s. the hashrate on the pool side is around 0.061 Ksol/s, on stock settings. It should run as high as 6*2.98 H/s on 6xGPU rig. How many hours have you tested, would you please test longer? AE mining on stock settings. local output is 2.98 H/s on P106, around 0.046 Ksol/s on F2pool. local output is 4.30 H/s on 1070, around 0.061 Ksol/s on F2pool. local output is 4.54 H/s on 1080ti. around 0.073 Ksol/s on f2pool. Only get ~2H with P106…somthing wrong with the configuration? The local output number looks low but if you check the poolside hashrate you will see a proper number. Could you please provide screenshots of the numbers with wattage from your miner for 1070? Could you please include your settings? The numbers you are listing doesn’t seem to add up to what I am getting. This is what I get on my 6x1070s. And this is the output from f2pool for the 6x1070s. Hi, very much for your test and feedback. @realbminer could you please show the output of your miner mining like I did? Specifically for 1070.
just added, please see the output on poolside.